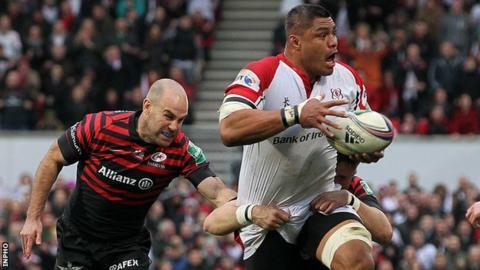 Ulster's Nick Williams insists revenge will not be an incentive for his side in Friday's European Champions Cup Pool 1 game against Saracens in Belfast. The Premiership leaders beat the Irish province in successive quarter-finals of the continent's premier club competition in 2013 and 2014. "There is no element of revenge. It's a new competition, a new team with new personnel," said the back-row forward. "We'll leave the past where it is and let the future take care of itself." He added: "We've had some good tussles with them in the past and they are an outstanding outfit - well organised in all areas of the pitch and well directed by Owen Farrell at 10." Saracens began their campaign with a resounding 32-7 win at home to Toulouse on Saturday, and the New Zealander said the 2014 runners-up were "on top of their game". "They have a very physical pack, they like to play a direct style and they are always tough to play against," he said. "You look for a weakness in their team but you struggle to find one. "Toulouse were maybe a bit emotional given the events that occurred in France and they maybe played the way Saracens wanted them to." Ulster's scheduled opening fixture against Oyannax on Saturday was postponed just over an hour before kick-off following the deadly attacks in Paris on Friday night and Williams believes "the right call was made". "There was an eeriness and sadness in France and it was the right thing to do to postpone the match and put what was best for France before rugby," he said. "We were four hours away from Paris, which seems a wee bit away, but when something like this happens, the whole country descends into mourning. "The lads were all hyped up to play and I know a lot of fans paid good money to come and watch us play but at the end of the day there are things more important than rugby."